Poppy (Papaver somniferum): growing, planting, caring. Papaver somniferum, commonly known as the opium poppy is a species of flowering plant in the family Papaveraceae. It is the species of plant from which opium and poppy seeds are derived and is a valuable ornamental plant, grown in gardens. An annual herb growing to about 100 cm (39 in) tall, the plant is strongly glaucous, giving a greyish-green appearance, and the stem and leaves bear a sparse distribution of coarse hairs. The large leaves are lobed, the upper stem leaves clasping the stem, the lowest leaves with a short petiole. It blooms between June and August, flowers up to 30–100 mm (1.2–3.9 in) diameter, normally with four white, mauve or red petals, sometimes with dark markings at the base. The poppy called "somniferum" is the one often found in our gardens, cousin of the corn poppy! It is an annual herbaceous plant with a stem that can reach up to 1.5 meters, with white or lilac flowers with a dark purple center. The capsule, round and large, contains many seeds. It is found in the Asian mountains but it is quite common in Europe. 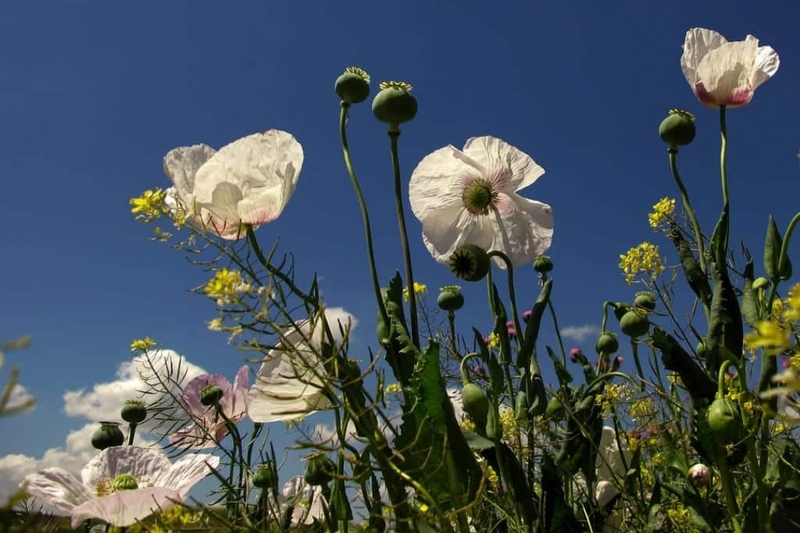 If you want to avoid the proliferation of seedlings - the poppy can become invasive! - cut the flowers as soon as they start to form their seed pods. Conversely, you can harvest the seeds!